Long-ignored freshwater molluscs in Cuba under threat | Cuba Headlines – Cuba News, Breaking News, Articles and Daily Information Among biologists, Cuba is famous for its diversity of molluscs with some 3,000 species, including the fact that over 90 percent of its land snails live no-were else. "> Among biologists, Cuba is famous for its diversity of molluscs with some 3,000 species, including the fact that over 90 percent of its land snails live no-were else. Among biologists, Cuba is famous for its diversity of molluscs with some 3,000 species, including the fact that over 90 percent of its land snails live no-were else. Given this, it's not surprising that Cuba is known as the 'paradise of malacologists' (scientists who study molluscs). However, one type of mollusc has been largely ignored in Cuba: freshwater. A new study in Tropical Conservation Science hopes to remedy that. According to the study there are 42 known species of freshwater molluscs. Although the percentage of endemic freshwater molluscs (occurring only in Cuba) is not nearly as high as its land snails, it is still considerable. Ten species are only found in Cuba, or nearly a quarter. Yet the study found that a number of these molluscs are in need of protection. "With the exception of some highly charismatic species of land snails, such as those of the genus Polymita and Liguus, no other species of molluscs are taken into consideration when selecting a protected area or delimiting its borders," the authors write. Currently, 24 of Cuba's freshwater molluscs are found in the nation's over 200 protected areas, leaving 18 unprotected. Three of these are only found in Cuba: Nanivitrea alcaldei, Nanivitrea helicoides, and Pachychilus nigratus. In addition, there are already concerns that the Nanivitrea species may have gone extinct. "Biodiversity conservation and managing are key activities for the health and existence of many ecosystems. However, mammals, birds or reptiles receive most of the attention, leaving molluscs and other taxa in a category that we might call neglected," the authors write. Molluscs are threatened by loss of habitat, tourism construction, and alien species. A rising population in Cuba means that many water areas, once habitat for molluscs, have been turned to provide water to a thirsty growing population. 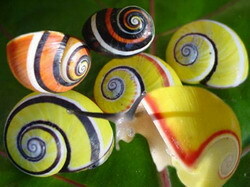 In addition, invasive species like thiarids snails are linked to some population declines of endemic molluscs by out-competing native species for food. Saving local molluscs species, according to the authors, could lead to important benefits for Cuban society. "The preservation of the Cuban endemic freshwater molluscs will not only help to sustain ecosystem functioning, but could also have an important impact on public health. Many of the introduced species of molluscs are usually considered as intermediary hosts of parasites responsible for some tropical diseases. These opportunistic species can establish themselves in disturbed ecosystems, reaching high densities in a short period of time. However, some of the endemic species may serve as biological control agents, which could outcompete the exotic molluscs and prevent their successful establishment if the natural habitat remains unaltered."